Brighton have appointed Zigor Aranalde as their new chief scout. 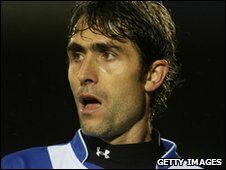 The Spaniard made 224 appearances in five years playing for Walsall and also had a spell with Carlisle United. Albion manager Gus Poyet told BBC Sussex: "We're going to have him at the moment for three months and then we will make the final decision. "I'm trying to make sure we know the quality of player we're looking for. I think he's got a big chance to stay with us for a while." He added: "He played in England and went back to Spain and did all his courses in terms of sport direction and coaching." Aranalde replaces former Albion manager Barry Lloyd, who has been in the role since September 2007. Poyet continued: "It's just renewing things, it's nothing against anyone. It's just a different way of watching football."